The average drop from the 52-week high on this list is just shy of 30%. Not too pretty. But beauty is in the eye of the beholder in these situations. 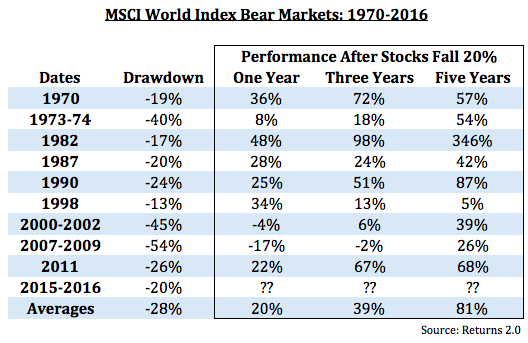 Historically, buying global stocks after they have fallen into bear market territory has been rewarding for investors. I looked at each of these bear markets to see what would happen if an investor bought stocks the month after they fell into a bear market (down 20%). This means that there were a number of cases in which stocks continued to fall in the short-to-intermediate term well past the 20% mark. Of course, things could always get worse before they get better. Central banking policies could wreak havoc on people’s confidence in the system. We could see a global recession. The U.S. could join the party and continue to fall even further. But investors and savers alike have to remember that falling prices are a good thing for future returns. 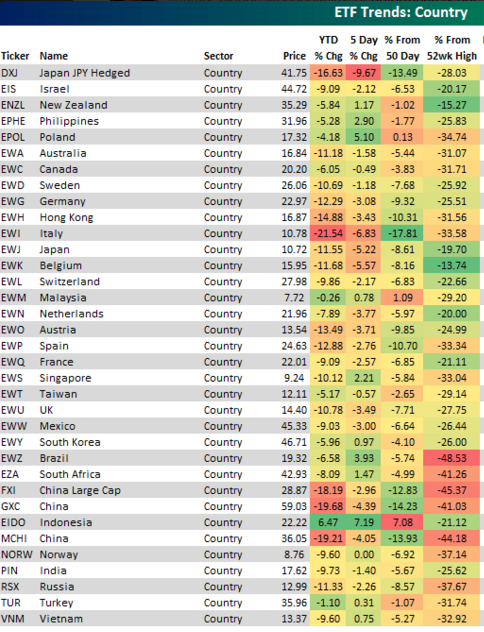 I looked at the dividend yields for each of the country ETFs listed above. The average yield is now around 3.3%. That’s more than one percent higher than the current yield on the S&P 500. Using the past as our guide, it’s clear that bear markets tend to be a great time to put money to work for those who can look past short-term volatility. Long-term savers and investors should see this as an opportunity, not a crisis. Global stocks are on sale.